One of our family's favorite recipes is Texas Tater Casserole. 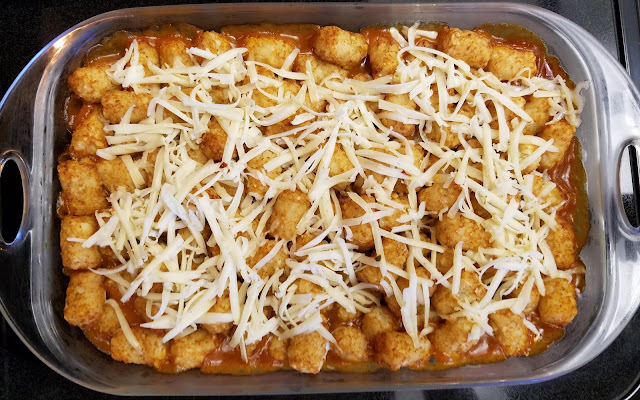 I originally found this recipe in the Betty Crocker Favorite Casseroles recipe booklet from September 1999, #154. A slight variation of the booklet's recipe can also be found online at the Betty Crocker website by clicking HERE. 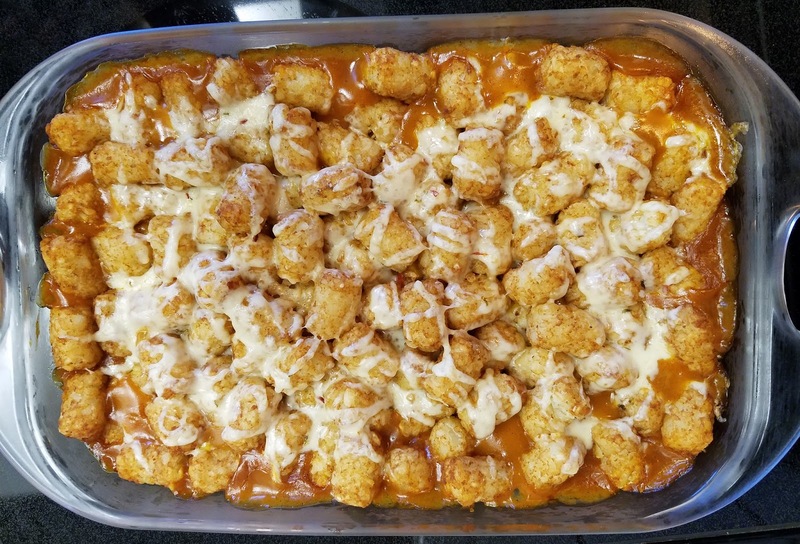 This casserole is yummy and pretty easy to make. 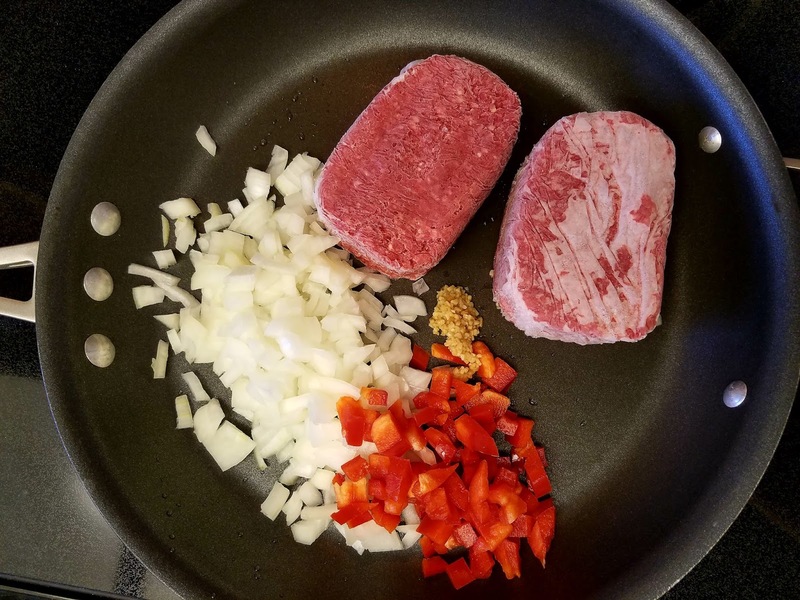 Cook ground beef, chopped onion, bell pepper, and garlic in a skillet until beef is brown. The original recipe calls for chopped celery. I usually just leave that ingredient out. But when I made this casserole last night, I used chopped red bell pepper instead of the celery. By the way, I didn't measure the onions, bell pepper or garlic. 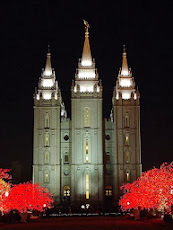 But that's okay. After draining the fat from the ground beef mixture, add cheddar cheese soup, corn, picante sauce, chili powder, and pepper. Top with your favorite tater tots and bake in a 375° oven for 40 minutes. The original recipe calls for a 16 ounce bag of tater tots, but I use a 32 ounce bag. and sprinkle with Pepper Jack cheese. I also didn't measure the cheese. The recipe calls for 1/2 cup of shredded cheese, but you can add as much as you like. Place the casserole back in the oven for 5-10 minutes or until the cheese is melted and the casserole is bubbly. Heat oven to 375 degrees. Cook ground beef, onion, bell pepper and garlic in large skillet over medium to medium-high heat. 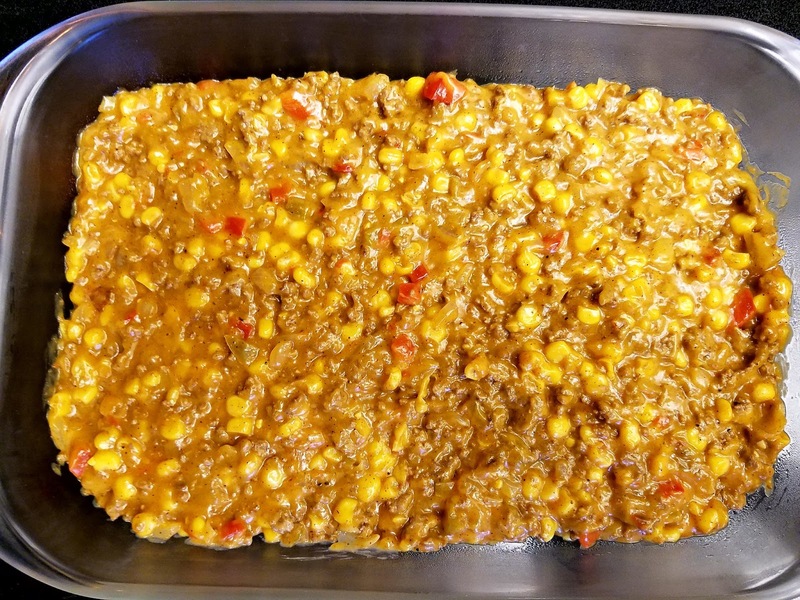 Stir occasionally and cook until beef is brown. Drain. 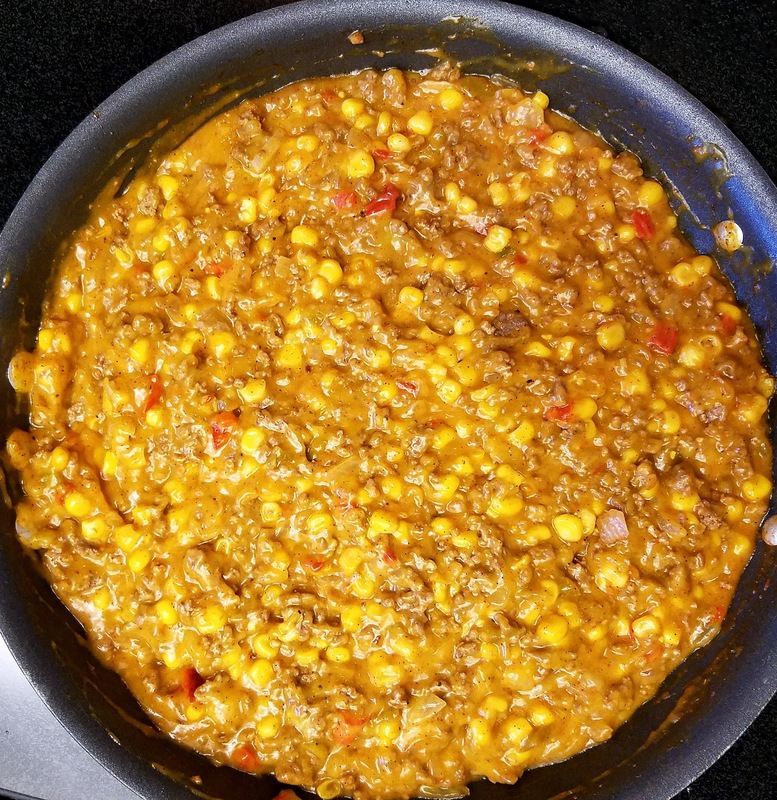 Stir soup, corn, picante sauce, chili powder, and pepper into beef mixture. Spoon into ungreased 13" x 9" casserole dish. 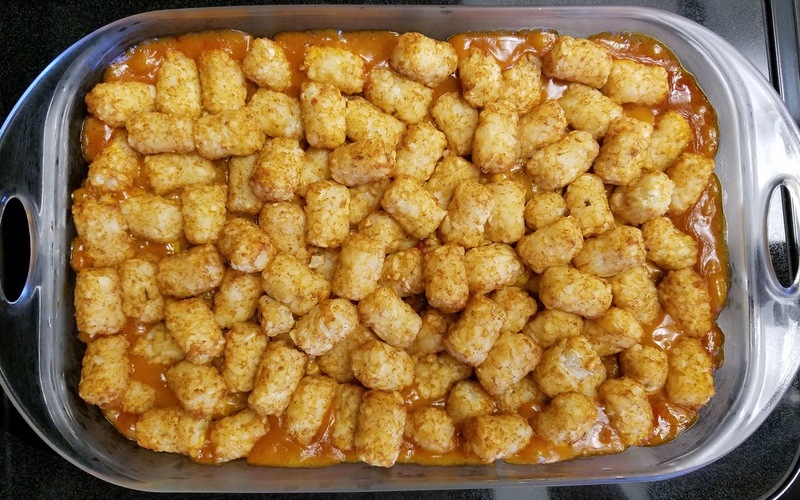 Top with frozen potato nuggets. Bake uncovered for 40 minutes. Remove from oven and sprinkle with shredded cheese. Bake an additional 5 to 10 minutes or until bubbly and cheese is melted. Recipe adapted from Betty Crocker Favorite Casseroles Recipe Booklet September 1999, #154. 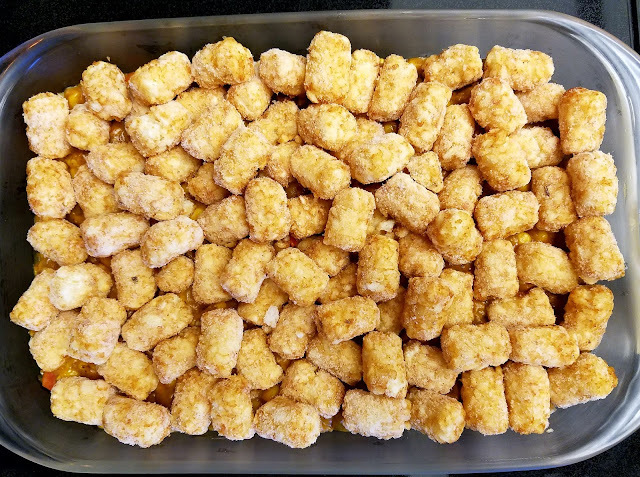 Isn't it amazing at all the recipes devised from those simple frozen tator tots! 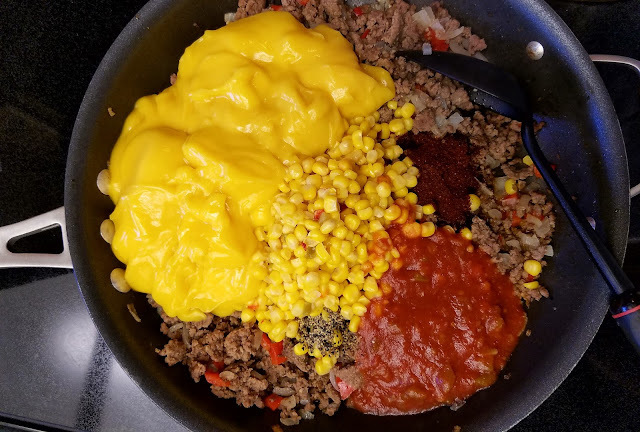 Reminds me of Sherperd's Pie. I bet it's yummy... In doing my Easter recipe posts, found it hard to snap the pics and concentrate on reading the recipes correctly.